Wah Seong’s 1QFY18 core net profit of RM26m was within our expectation but below consensus estimates. Core net profit increased significantly yoy mainly due to ramp up of Nord Stream 2 pipe coating contract and higher contribution from industrial trading segment. The group’s order book stood at RM2.51bn (1.0x FY17 revenue cover) comprising mainly of O&G job (c.85% of total order book). RM5.8b worth of tenders has been submitted as of 1Q18, an increase from RM5.0bn in 4Q17. Maintain forecast. We maintain our HOLD rating with unchanged TP of RM1.48. Results within HLIB estimates but below consensus. 1Q18 core net profit came in at RM25.7m, accounting for 24.8% of HLIB and 22.9% of consensus estimates. YoY: Core net profit increased three-fold mainly due to ramp up of Nord Stream 2 (NS2) pipe coating contract and higher contribution from industrial trading segment, partially offset by weaker margin in renewable division. QoQ: Core net profit decreased 34.2% mainly due to lower contribution from O&G and renewable divisions, partially offset by stronger performance from industrial trading segment. Nord Stream 2. We understand that completion rate of NS2 contract currently stood at c.40-41%. To recap, NS2 contract is worth RM3bn and is expected to complete in 3Q19. Order book. Its current order book stands at RM2.51bn, of which 85% is from O&G segment. NS2 takes up significant portion of its order book and cost management of the project is essential to the group’s profitability. Tender book. Its tender book is at c.RM5.8bn, increase from RM5.0bn in 4Q17. Bulk of the tender book is from O&G segment, which can potentially help to sustain revenue momentum beyond 2019 upon expiry of NS2 project. Outlook. Impact from change of government is still unclear at this juncture. However, there is potential delay risk from the Trans Sabah Gas Pipeline, which will be funded by soft loan from the Export and Import (EXIM) Bank of China. The project may be subject to review by the new federal government. 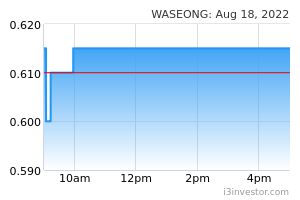 As a result, the award of the pipe coating contract which we deem Wah Seong as a strong contender may be delayed. Forecast. Maintain forecast for FY18-19. We introduce our FY20 earnings forecast of RM105.5m. Maintain HOLD, TP: RM1.48. Maintained HOLD with unchanged TP of RM1.48 pegged to unchanged 11x FY18 PER.